Six British warships stationed in the Persian Gulf are breaking down because the water is too hot. 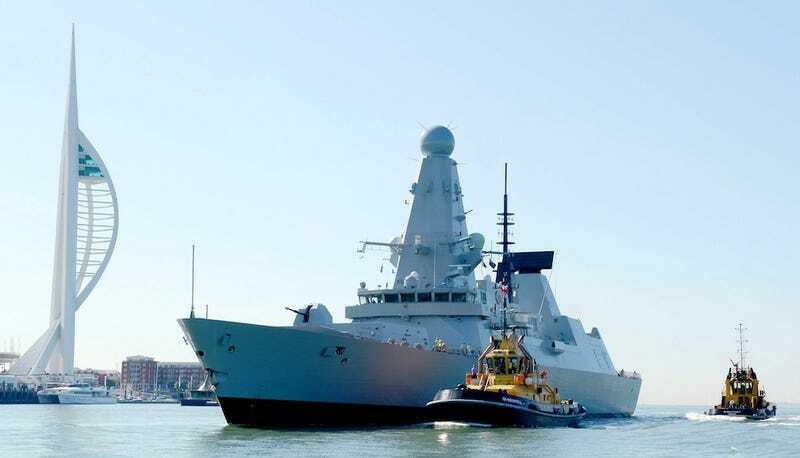 This week, members of the British Navy testified to the UK’s Defence Committee that their Type 45 destroyers keep losing power because of high ocean temperatures. When the ships’ turbines get overheated, they can’t generate as much energy, resulting in electrical failures. The makers of the billion-dollar warships, including Rolls-Royce and BAE Systems Maritime, claim that the ships were not designed to be used in that kind of environment for an extended amount of time, although they are supposedly engineered for a wide range of temperatures from sub-Arctic to tropic. The Persian Gulf is a very shallow body of water that absorbs more heat than the open ocean, and it’s situated in one of the hottest places on Earth. Water temperatures regularly range from 75 to 90 degrees Fahrenheit. Normally this the part of the story where I would say something like, in an exceptionally hot year on an exceptionally hot planet, the Gulf States have recorded many of their most extreme heat waves in recent months. A “heat dome” stretching from Dubai to Beirut resulted in the second-highest heat index ever recorded on Earth; the air in the Iranian city of Bandar Mahshahr felt like 165 degrees Fahrenheit. Due to climate change, this is likely to become the norm: A recent study noted that the Persian Gulf region will not be fit for human habitation by the end of the century because of regular, relentless heatwaves. Instead, I’d like to end with this thought: This news might be just the kind of thing that wealthy governments need to hear. Because if there’s anything that will motivate a country to take action around climate change, it’s when climate change starts to interfere with their ability to effectively kill other humans.